KLAVON, Thomas James - age 68, of Fenton, died Monday, January 14, 2019. Funeral Mass will be celebrated 11 AM Friday, January 18, 2019 at St. John the Evangelist Catholic Church. 600 N. Adelaide St., Fenton with Fr. David Harvey celebrant. Interment will be held 1 PM Friday at Great Lakes National Cemetery. Visitation will be held 10 AM - 11 AM Friday at the church. In lieu of flowers contributions may be made to the I.L.O.F., Seawolf Association, C/O Gary Fly, 9540 Vista Hills Place, Lakeside, CA 92040-5833. Thomas was born August 12, 1950 in Detroit, the son of Frank J. and Anna M. (Seman) Klavon. He married Maria Galea on September 8, 1973. 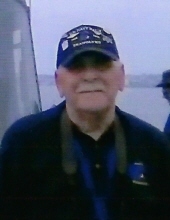 Thomas was a veteran of the U.S. Navy serving in Vietnam where he was awarded the Purple Heart. He retired from Chrysler Corporation after 40 years of service. Thomas was an avid outdoorsman and craftsman. He enjoyed traveling, playing hockey as a goalie and coaching youth hockey. Surviving are: wife, Maria; son, Paul (Victoria) Klavon; and daughter, Mia (Thomas) Gollier. Arrangements by Sharp Funeral Homes, Fenton Chapel, 1000 W. Silver Lake Rd., Fenton. Tributes may be shared at www.sharpfuneralhomes.com. To send flowers or a remembrance gift to the family of Thomas James Klavon, please visit our Tribute Store. "Email Address" would like to share the life celebration of Thomas James Klavon. Click on the "link" to go to share a favorite memory or leave a condolence message for the family.